When I think of a smokehouse, I immediately think of bbq pits out back, smoke coming out of the stack, the smell of slow cooking meat permeating the air, and the cooker knowing that there is a clear distinction between grilling and bbq. You should never open a restaurant because you believe that there is a certain food choice needed in that location. You should open a restaurant because you are a darn good cook, you know your craft, and you would count it a privilege for anyone daring enough to try it. Well Route 66 Smokehouse you opened up a restaurant in the financial district of New York, not because you labored in developing your craft of good bbq. You opened it, because everyone gets tired of bringing leftovers for lunch everyday and also there are the lazies like me, who rarely bring their lunch from home, so any neighboring restaurant from my workplace will do as long as it looks clean and if people appear to be enjoying themselves. Unfortunately my eating experience at Route 66 Smokehouse only gave me the pleasure of sitting outside, because who doesn’t love to eat outside on a beautiful New York day. 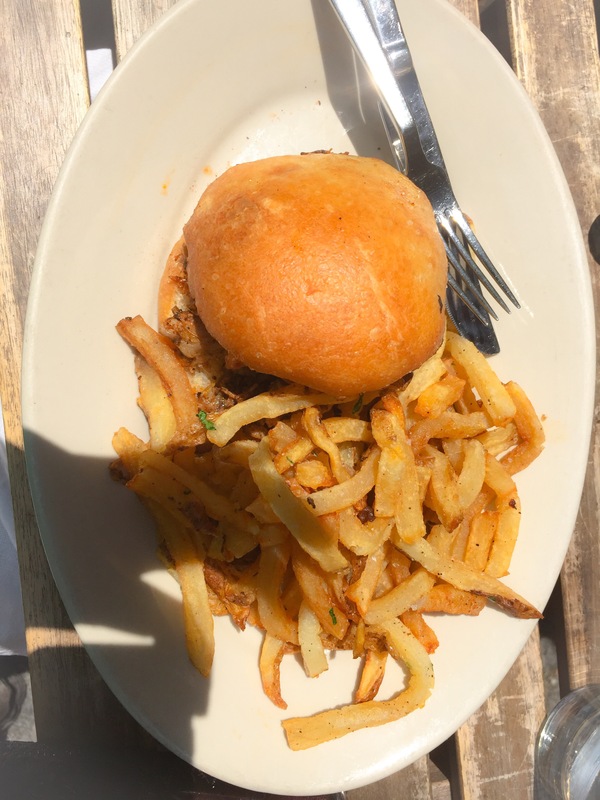 First up the pull pork sandwich on a brioche bun, the name alone compelled me to try it along with the semi-thin fries. Upon my first bite I thought “do I have a piece of meat in my mouth?” because I tasted absolutely nothing, the sandwich was completely and unequivocally bland; I added extra bbq sauce, but nothing could help this lost cause. Now it is super important to always give credit where credit is due, so I write that to write the meat was very tender, but what is tenderness without taste, its kinda like having faith without works. The brioche bun was buttered, but it didn’t taste buttery I am just assuming it was from the sheen on the top of the bun. The fries were undercooked, and in my novice opinion I always think that when people cook fries they should always have a rule of thumb which is, “how can I make these better than McDonalds?” Third up corn on the cob which should be a staple at every bbq joint, and theirs were actually ok, grilled, a little dark sparks on the kernels for presentation purposes, lightly buttered and lightly salted. 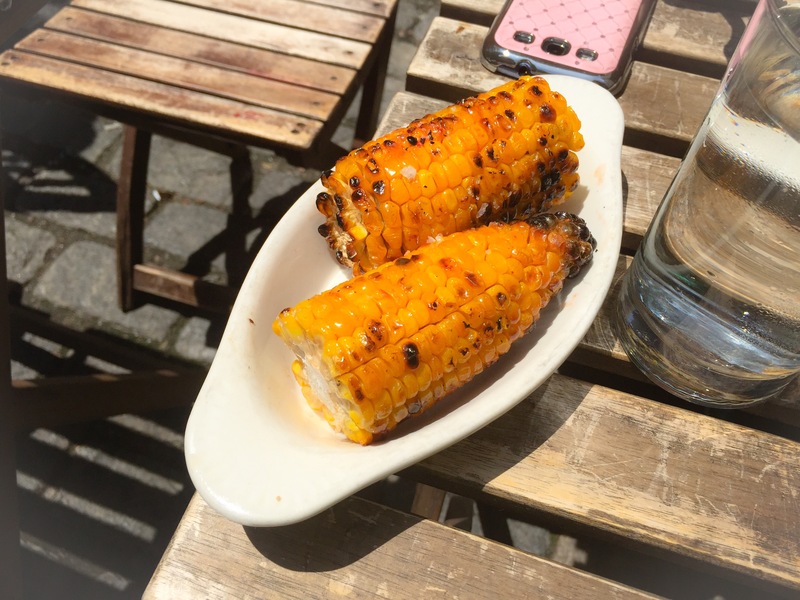 But how many of you know that if you have good sweet corn, no salt is required and very little butter is needed. Fourth up, jalapeño corn bread…Route 66 just take this off the menu now, and I do mean right now. Why in the name of all that is lovely would you decide to serve greasy, unsweetened, dry, non-buttered, rubbery cornbread or should I write cornmeal? Was that your way of saying I got your money anyway, so I dont care what I serve you? Or is it simply unskilled culinary at work? Now if you insist on keeping the cornbread on the menu i am going to make a recommendation that will be completely free of charge, here it is. 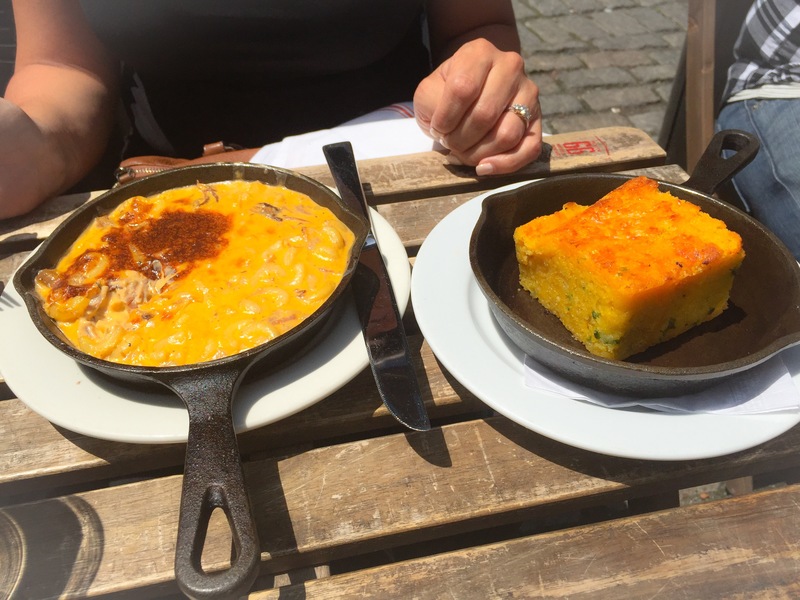 Contact Warmdaddy’s in Philadelphia and ask the chef if he would give you a skillet cornbread lesson, and if he says yes, make sure you recognize the gift in front of you, take him your weight in gold as an offer to him, because it will officially change your life, as it is the best cornbread on the PLANET!!! Last up macaroni and cheese with pulled pork, or should I write kraft box cheese macaroni. Again giving credit where credit is due, you definitely get points for presentation of placing the dish in a cast iron skillet, but again you do know that presentation means nothing if the food isn’t good. Clearly box cheese was used here, with no obligation to season along with the bland pork equals an unacceptable meal. It is not very often that I come across a restaurant where everything ordered was sub par, but clearly it does happen, and I dont feel that bad because the food was crummy, I feel bad because I recommended this place to my lunch date, and no one wants to be remembered by the poor food they received. smell it on the inside. Too bad. It looked good. I have had bad BBQ before and it can be frustrating.